The seismic shift under way in the Middle East continues to widen, but it is not expressed so lucidly in our media through its polarised language: pro-regime, anti-regime, Islamists, secularists, Mursi supporters or otherwise. Some want you to believe that it was all a devilish plan hatched years in advance with the ultimate aim of sending the Arabs into complete disarray to the benefit of Israel. They say so discounting the fact that convincingly popular revolutions, especially the ones that can be sustained for years, are hardly ever the work of plotting political elites, no matter how resourceful or influential. The neoconservative clique that reigned supreme during the Bush era, choreographed the toppling of the Saddam Hussain statue and sold it to international media as Iraqis celebrating their freedom by American invaders. 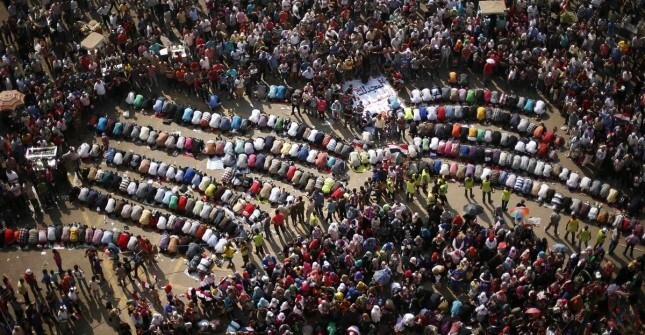 Those charlatans would not be able to fill Cairo’s squares with protesters and keep them there for even one hour, needless to say for more than two years and counting. Others insist that all this turmoil is but a spontaneous series of revolutions that are inspiring one another, with no outside interference whatsoever. Just because the Middle East is polarised around political, ideological or sectarian lines, political analysis does not have to follow suit. From the onset, oversimplification of the multifaceted conflicts that sprung up all around the region, defined our understanding of what turned to be neither a full-fledged conspiracy, nor unadulterated popular revolts. The Arab turmoil was called an ‘Arab Spring’, but even if that ‘spring’ had ever existed in the shape and form that the media portrayed it to be, it never really lasted. It has now morphed into something far more complex. But it is not an ‘Islamic winter’ either, a foreboding term favoured by Israeli policymakers and analysts. The Islamic dimension of Arab rebellions should have been palpable from the very start to anyone who cares to understand political reality beyond its usefulness as a propaganda tool. Collective struggles for political definition have existed for decades, long before Tunisia’s ‘Jasmine Revolution’ and the Egyptian Revolution. Equally relevant, political Islam had been an essential component of that struggle, which at times turned very bloody. In recent history, there has not been one successful union between Islam and Arab ruling classes — successful in the sense that it contributed to progress, rights, and prosperity for all. Islamists were either coopted or conflict reigned. The atrociousness of the results of these conflicts varied depending on how clever Arab rulers were in their management. In Jordan, low-level discord has always existed between Islamic opposition parties and the ruling class. It teetered between partial inclusion of Islamic forces in a parliament that operated with little authority and occasional spats or political crises of little consequence. However, not all failed experiments came at a relatively low cost. In Algeria, an attempt at harmonisation went terribly wrong. The 1991 Algerian civil war lasted for over a decade and resulted in the death of up to 200,000 people. Things were not meant to be so bloody, as it had begun with something rather promising: an election. The ruling National Liberation Front (FLN) cancelled elections after the first round, fearing what seemed like an assured loss at the hands of the Islamic Salvation Front (FIS). The promise turned into Algeria’s second worst nightmare, the first being its even bloodier struggle for liberation from colonial France. All ingredients were in place for a complete disaster. There was a strong army running the country through a deeply enriched ruling party, an emboldened political opposition that was about to achieve political power using the ballot box, and a thoroughly frustrated public eager to move beyond the tired slogans and economic disenfranchisement. The similarities between the Algerian and Egyptian experiences are eerie. On January 25, 2011, Egyptians revolted with the hope that they could finally break the stranglehold of the ruling elites: The National Democratic Party, with its adjoining business class and the army, which operates its own massive economy within the haggard Egyptian economy. After the revolution was declared ‘victorious’, the army remained in charge, although it branded itself as if it were the guardian of the nation and its revolution, using the same old corrupt media. Meanwhile, there was never a cohesive structure that would allow Egyptians to translate their collective aspiration into anything tangible. The only available forum was that of elections and referendums, and every single one was squarely and democratically won by Islamic parties. Fair and transparent elections maybe, but their results allowed the Mubarak regime to resurface. Using its never dismantled infrastructure, notwithstanding a most corrupt media owned by powerful businessmen, , the old regime managed to turn the revolution against itself. It cleverly sold the June 30, 2013 protests as if they were a call to correct the wrong path taken after the January 25, 2011 revolt. In a strange turn of events, millions of those who protested against Mubarak were back protesting against democratically-elected Mohammed Mursi, allying with the very political forces that wrecked the country for many years, calling on the same army, and siding with the ‘baltajiya’ — thugs who terrorised protesters merely two and half years ago. Not that the situation is much better in Tunisia, the harbinger of the so-called Arab Spring where recent assassinations of high profiled politicians brought the country back to the brink of a wider conflict. But despite the bitter struggle between ruling elites doing their outmost to cling to power and the massive popular discontent, it is difficult to imagine a return to the old Middle East paradigm, of powerful elites backed by formidable allies, oppressing weak, dismissible peoples.